Change the Maximum size of the Recycle Bin (Independently) (Windows XP) - TACKtech Corp.
With hard drives now reaching 1TB, 10% seems excessive for a maximum Recycle Bin size. 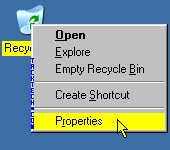 Confirm the Recycle Bin does not contain anything that should be restored. 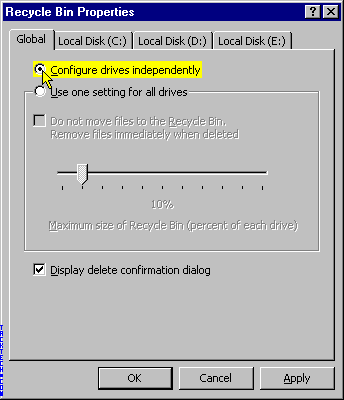 Select the Configure drives independently option. Click on each of the drive tabs. 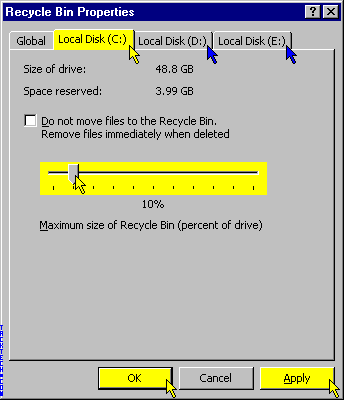 Move the slider to adjust the Maximum size of the Recycle Bin (percent of drive).